EID UL ADHA – THE FEAST OF EVERGREEN SACRIFICE! টেলিভিশন বিজ্ঞাপনগুলো কী শিক্ষা দিচ্ছে? Hello everyone! Everybody want the peace in their life..Don't you want so..If you want to know what is peace and how to gain it...I think this is the right place to knock. This website will help you to find out the concept of peace in your life. It also help you to know about the concept about the God which is the original way to find out the Peace. In this site you will find Comparative Discussion of the major world religions that will help you a lot. 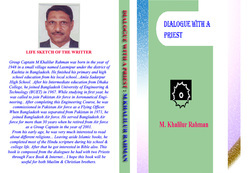 It also offers many fascinating stories and poems that will refresh your mind. So have a nice time......!!! Now let's talk about Comparative Theology.Comparative religion is that branch of the study of religions concerned with the systematic comparison of the doctrines and practices of the worlds religions. There are many benefits to such a course of enquiry but in general the comparative study of religion yields a deeper understanding of the fundamental philosophical concerns of religion such as ethics, metaphysics and the nature and form of salvation. A person who has undertaken such a course of study has a much richer and more sophisticated understanding of human beliefs and practices regarding the sacred, numinous, spiritual and divine.